But social influence doesn’t just lead us to do the same things as others. In some cases we conform, or imitate others around us. But in other cases we diverge, or avoid particular choices or behaviors because other people are doing them. 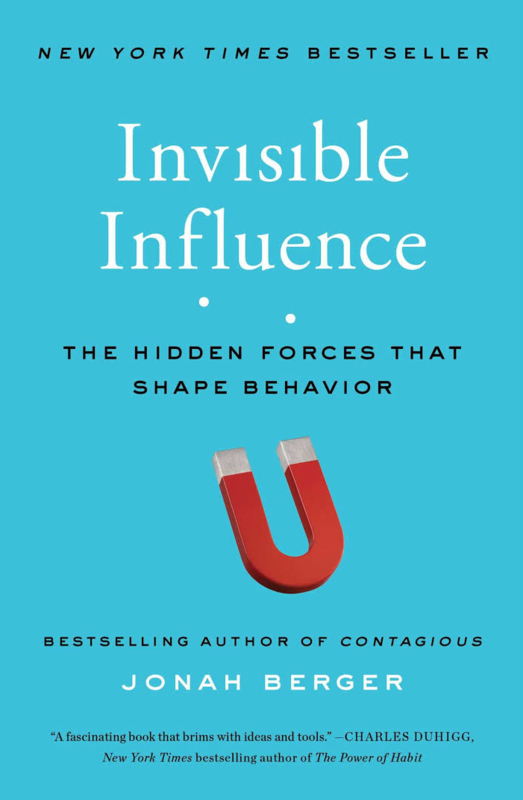 In Invisible Influence, Jonah Berger integrates research and thinking from business, psychology, and social science to focus on the subtle, invisible influences behind our choices as individuals. By understanding how social influence works, we can decide when to resist and when to embrace it—and how we can use this knowledge to make better-informed decisions and exercise more control over our own behavior. There is only one place we don’t see social influence—ourselves. Drawing on ingenious research and scientific experiments, Jonah Berger picks up where his Contagious: Why Things Catch On (2013) left off to explore why we act as we do, politically, socially, and economically—often influenced by social forces and contexts we are unconscious of. Results: Social influence as a purchase motive vanished when respondents held up a mirror to their own actions. (Berger explains the same applies to clothing, voting and even courteous driving.) People could see social influence affecting others’ behavior, but not their own. We humans imitate each other. At the same time we are driven to be different. How the competing desires to imitate and to be unique play out depends on the context and who the “other” group is. The competing desires to imitate and to be unique mean the most successful new products are similar but just different enough. People perform simple tasks better when others are present but perform complex tasks better when alone. Rewards and punishments are not as effective at influencing behavior by modeling. When waiters at high-end restaurants repeat each diner’s order in elegant and appetizing detail, not only does the perceived value of the meal increase but also the diner’s appetite, and the tip increases as much as 70%. People like to be included in the elite group of likers. When the crowd of likers of a rock band gets too big they say, “I like their old stuff” to be included in a more elite group. They want it to be known that they liked the band before most others did. Sometimes a mere hint that something is gaining steam is enough to make some people dislike it. Working class people prefer similarity. People from middle-class backgrounds avoid picking popular items. People from working class backgrounds don’t have an aversion to fitting in. They pick popular items over less popular items. Less rather than more difference is preferred. East Asian cultures foster more fitting in, while American culture rewards individualism. The $300,000 watch that doesn’t tell time. At 2008 Baselworld (the watch industry’s annual international expo) visitors were treated to a special announcement. Renowned Swiss watchmaker Romain Jerome was releasing something unique. The watch was called Day & Night. It was made in part from steel salvaged from the Titanic and it contained not one but two separate tourbillions designed to combat the negative effects of gravity on watch accuracy. One noteworthy detail: the watch didn’t tell time. This is how it was marketed, “With no display for the hours, minutes or seconds, the Day & Night offers a new way of measuring time, splitting the universe of time into two fundamentally opposing sections: day versus night.” The watch sold out in less than forty-eight hours. People will clamor to be part of an elite group. Only a very few can afford something so expensive and nearly afunctional. Honda designed the Element to appeal to twenty-somethings and their ads reflected that. The ads included outdoor fun and young people having great times together. Honda pitched the Element as a dorm room on wheels that could haul bikes and surfboards, but research showed it also appealed to thirty and forty-somethings who found it perfect for hauling around children and groceries. Senior citizens loved its spacious interior and low price tag. So, the Element stopped signaling “hip” and started communicating a more inclusive message. Rather than preaching about the ill effects of binge drinking, a more effective campaign featured a poster with a geeky looking guy holding a drink. Students who saw the poster reported drinking 50% less alcohol. In 1899 a clever inventor added a fake horse head to the horseless carriage to help consumers feel more comfortable with the idea of the radical invention. TiVo made their digital appliance look similar to a VCR even though it didn’t need to be nearly as big. Design can be used to make incremental innovations feel more novel. The first iMac was shaped like a gumdrop and came in colors like tangerine and strawberry. Different messages were given to heads of households to encourage lower energy consumption. The socially responsible tact didn’t work. Neither did the message stating how much money consumers would save each month. The message that ended up working was one that stated how many of their neighbors were saving energy. Social comparison information motivates consumers to change behavior. Social comparisons can be a powerful motivating force but if not carefully designed, social comparisons can lead people to quit, especially if the “game” is set up as “winner take all.” Only the top contenders can get excited about that setup. In the 1930’s the US began to develop public housing as part of the New Deal. The National Industrial Recovery Act directed the Public Works Administration to clear the slums and construct low-income dwellings. The first of fifty such projects was in Atlanta in 1936. Scientists began to study the effects of randomly giving some families the opportunity to move to better neighborhoods, while others stayed put. Moving to lower-poverty areas improved overall well-being. Children were more likely to attend college and go on to live in better neighborhoods. They emulated their peers. Reading tip: Keep an open mind. We are all subject to social influence. Understanding how, gives guidance on how we can create effective marketing programs. Dr. Karl Hellman is President of Resultrek Inc., a marketing and sales consulting firm. Karl is the author of The Customer Learning Curve (with Ardis Burst, 2004) and his clients include best-in-class companies such as JP Morgan Chase, Wells Fargo, UPS, and Coca Cola.